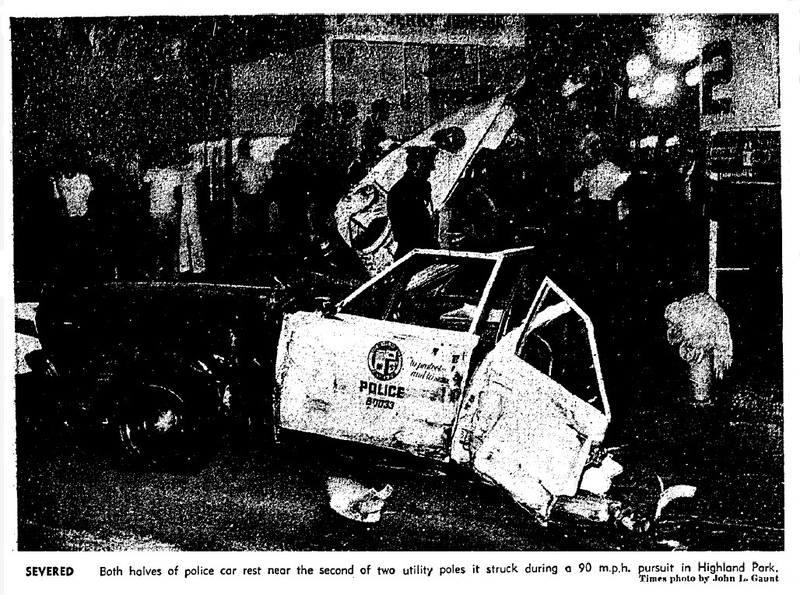 Late on the evening of Monday, Aug. 22, 1966, LAPD Officers Gilbert Blake, 33, and Malcolm Beaty, 25, were on patrol in the Highland Park neighborhood when they noticed a speeding car. They attempted to pull over the car, a dark blue 1964 Corvette, but the driver accelerated and sped off. The patrol car, with Blake behind the wheel, continued to chase the Corvette along North Figueroa Street, at speeds reaching 90 mph. Beaty was on the radio to police headquarters, reporting the chase, the description of the fleeing car, and its license plate number. Eventually, the patrol car pulled up alongside the Corvette as the two cars approached York Boulevard. The driver of the Corvette turned sharply, attempting to sideswipe the patrol car, or force it off the road. Blake swerved to avoid the collision and lost control. The patrol car hit a utility pole, then traveled another 70 feet before hitting a second utility pole, which ripped the patrol car in half. Beaty was thrown out of the car onto the sidewalk, while Blake remained trapped in the wreckage. Flying fragments of the vehicle also hit a pedestrian, 54-year-old Mike Ornar, as he stood on the sidewalk. Other officers arrived and picked up the chase, but they lost the fleeing vehicle in the darkness, about a mile from the scene of the crash. Blake and Beaty were taken to Central Receiving Hospital, where Beaty, who suffered a fractured skull, underwent emergency brain surgery. Ornar was taken to General Hospital. At the time of the crash, Beaty was reporting the license plate number of the Corvette, but he was only able to give a partial number -- PBA3 -- before he was thrown from the vehicle. With that partial number and the description of the car, police checked with the state vehicle registration computer system in Sacramento and found one car that matched. It was registered to a 25-year-old Glendale man, who was arrested the next morning at his job at the Metropolitan Water District's Eagle Rock Control Station. The driver of the Corvette was charged with battery on a police officer, assault with a deadly weapon, and three counts of felony hit-and-run. When Beaty died of his injuries a week after the crash, a murder charge was added. Blake and Ornar both recovered. 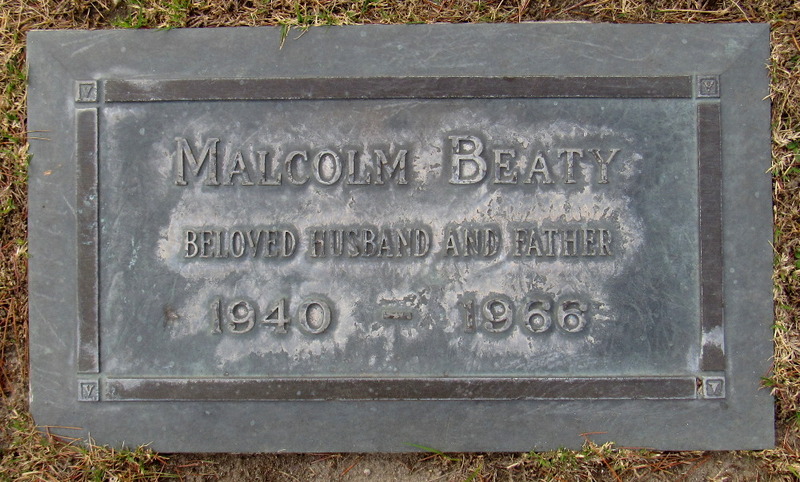 Malcolm Beaty was born Dec. 23, 1940, in Los Angeles, the eldest child of Wendell Leroy and Elizabeth Marie "Betty" Childs Beaty. Malcolm was followed by a brother, Orval, who was born in September 1942, but died at four months; a brother, Forrest, born in September 1944; and a sister, Julia, born in October 1947. On April 8, 1962, Beaty married Cecil Drake Montee. At the time of Beaty's death, the couple had two daughters -- Shelly, 3, and Christina, 1 -- and Cecil Beaty was pregnant. The couple's third daughter, Dana, was born four days after her father's death. Beaty's fellow officers from the Highland Park Station helped to renovate the Beaty home in La Crescenta after Dana was born. The driver of the Corvette was found guilty of manslaughter, and sentenced to 180 days in jail and three years' probation. Funeral services for Beaty were held at the Utter McKinley Mortuary in Los Angeles, with burial at Valhalla Memorial Park in North Hollywood, California. Beaty's sign -- with both his first and last names spelled incorrectly -- is located on the northeast corner of West 6th Street and Loma Drive, in front of the LAPD's Rampart Station.